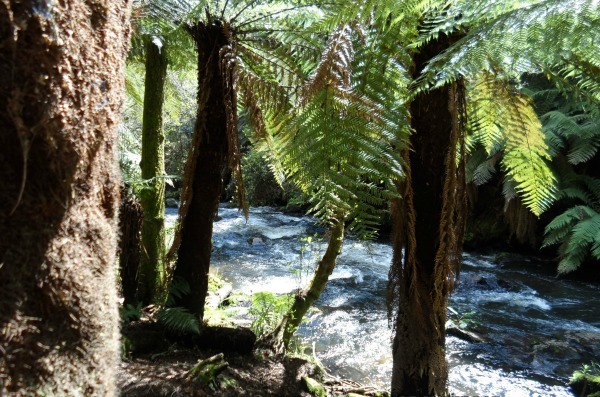 The Hemo Gorge Trail, one of the lesser known walks in Rotorua, is a great one to do if you're strapped for time, want a quick pick me up or just out for pleasure. Better yet, it's right on the city fringe so not too far out. 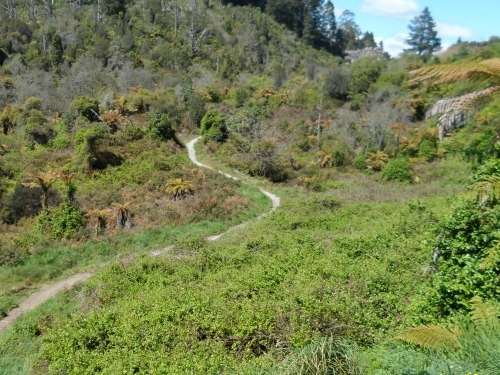 The walk, ½hr - 1hr max, is a tiny section of the New Zealand Cycle Trail network (Nga Haerenga) running the length and breadth of the country. Thank goodness this section is dual-purpose to include walkers and runners. I would hate to miss out on it. The walk begins at the far end of Te Puia's southern-most carpark OR at the Waipa mountain biking carpark. 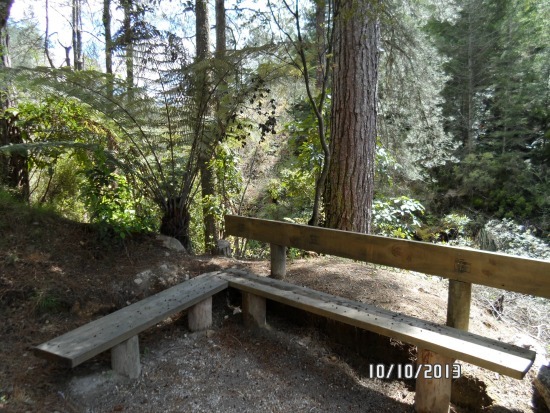 The focus here is on beginning at Te Puia's carpark as it's closer to the city. 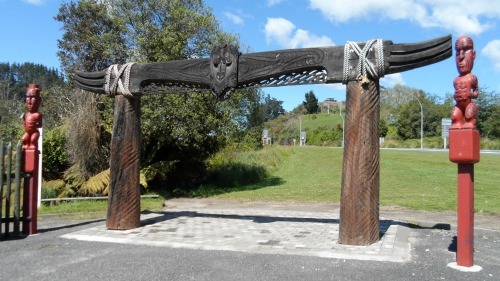 An imposing gateway (waharoa) stands at the entrance into the trail. 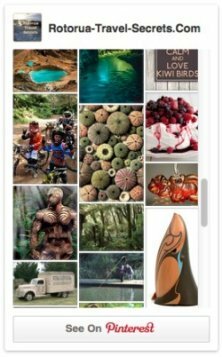 The carvings tell the story of a renowned Te Arawa ancestor by the name of Hatupatu and his run-in with Kurangaituku, the dreaded bird-woman. You can read the story on information boards located to the side of the waharoa. Walk left through the waharoa to begin a drop down onto the floor of the valley. There's a short meander through scrub; grasslands is probably the politically correct term but that's not me so will stick with how I see it. Hope that's okay with you. From here it's not long until the enticing playfulness of water and dank smell of earthy vegetation comes out to meet you. It's lovely once you get into trees and ferns. The water is tantalisingly close but you can't really see it for a bit. Once you do you're right there with the stream. The track is single file a lot of the way so care needs to be taken that you don't run into a biker. It breaks off periodically too with steps down to the side of the stream and hopefully grassy banks once the vegetation begins to grow. Did I mention that this track is relatively new? It was built in 2013. Seating is available at various points if you want to sit and while the day away. 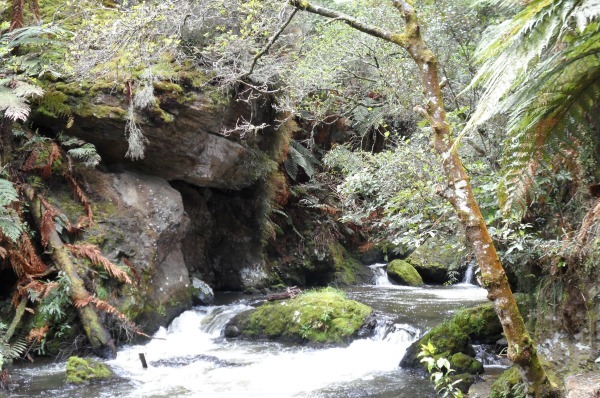 A couple are above the stream with some down beside it. In the summer it wouldn't hurt to have a blanket to lie on or just lay on the grassy patches if you've a mind to. 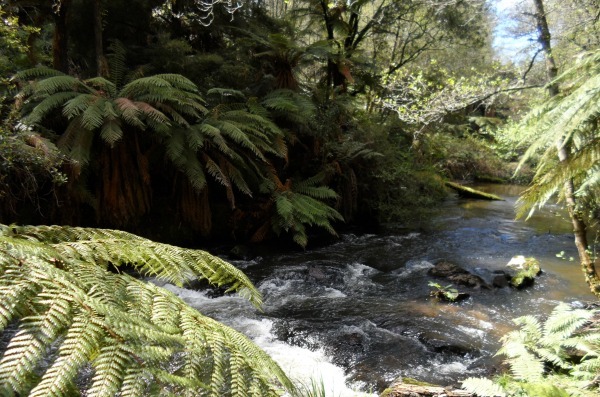 It's definitely an ideal place to stop and have a picnic if you have a fueled up day-pack. 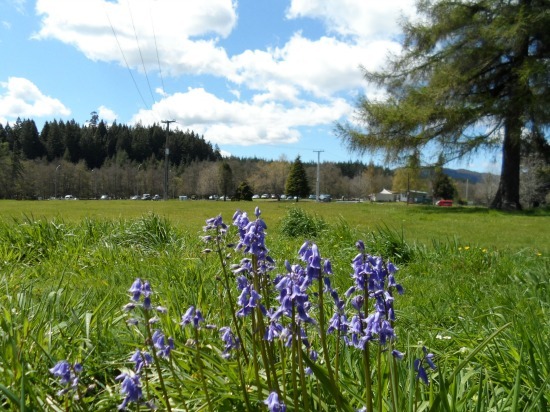 Once you arrive at another waharoa (gateway) it's not too far to the Waipa mountain bike carpark. On site is Mountain Bike Rotorua and the Waipa Store where you can purchase refreshments like coffee, muffins, sandwiches etc. Refueled and ready to go again? Head back the way you came and that's your Hemo Gorge Trail walk done. I hope you enjoy it as much as my friends and I do. PS. If you're up for it, check out the challenge below. Self-drive along Fenton st heading south (away from the lake) to Te Puia. OR catch a bus to Te Puia, route no. 2, if you have no vehicle. Walk left through the gateway and you're onto the trail. 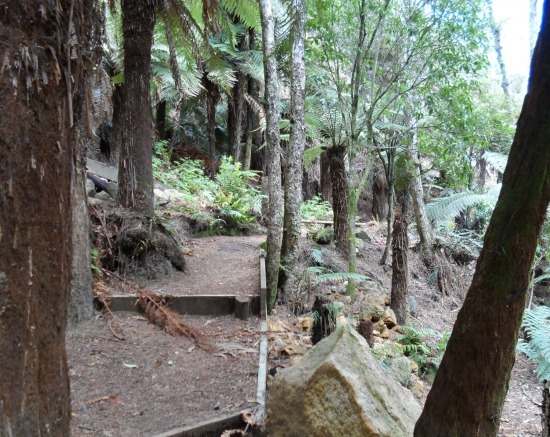 Follow it for 1.5km to the Waipa mountain bike carpark, then return the same way. 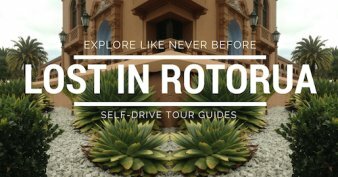 If you take a look at the google map, ignore the big loop. This is an extra bit I've tagged on (below) for people up for a challenge. For an extra challenge for the fitter person, take another look at the google map. I've added on a loop up, up, up to the Trigg station. If you walk from the Te Puia carpark at a fastish pace it would take just over an hour to complete the whole thing if my memory serves me correct. I better get out there and check huh? Well, I've just been out to walk the full route with my brother Darrel and it took us 56min. I knew I was in for a workout and I wasn't wrong. He hurtled me around the course with no slowing down to take in the views let alone time to take a breather. Whew, I'm glad that's over! View from the Trigg. 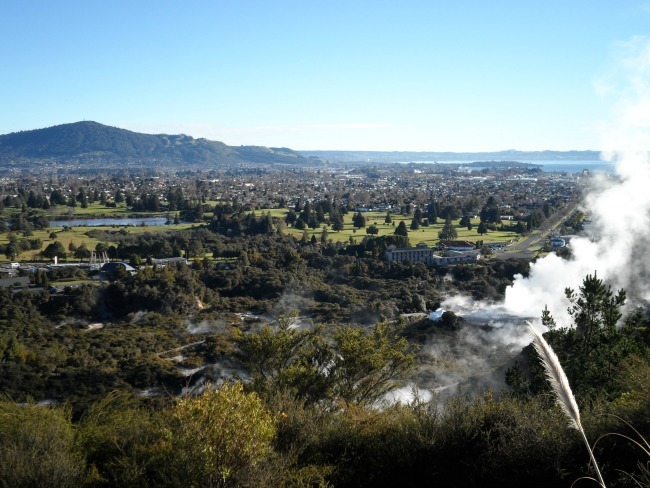 Whakarewarewa Thermal Valley center front, Mount Ngongotaha in the background and Lake Rotorua top right. 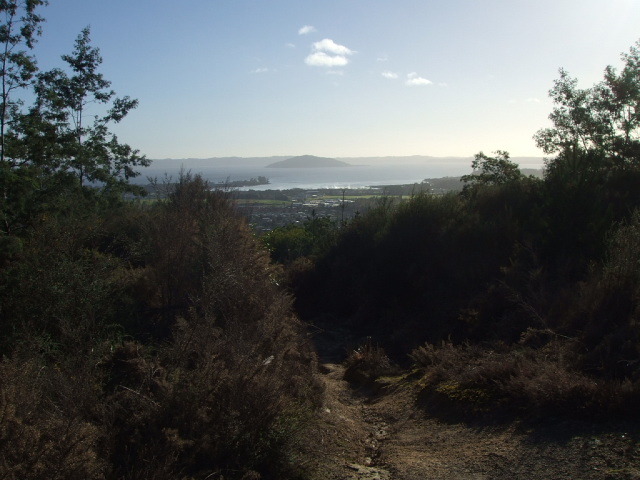 It's quite a steep climb to the top - going up the left-hand side of the loop - but on the way up there are great views over Rotorua and Whakarewarewa Thermal Valley. It was getting on to 30mins at this point. Nearer the top there's a right-hand turn to the Waipa Lookout. It's a short walk in amongst trees and just backtrack to the track once finished. Coming back down is definitely harder on the knees and yes, I know this from experience. It's possibly steeper than going up and quite rough too because horses use this track. Dry and dusty in the summer which can be slippery and definitely muddy and slippery in winter. View from the Trigg. This is what the track is like, all the way down. Once down the bottom the track veers left and you will see a sign on your right pointing to another way of getting up to the Trigg. Don't go that way. When you come to the first right-hand turn it's downhill again. Continue along this, (no left turns) you will end up coming back out on the bottom of the hill you first went up. From there make your way back to the beginning. If you look at the google map in the larger view and click on Satellite view you should be able to orient yourself quite well. Happy wandering.